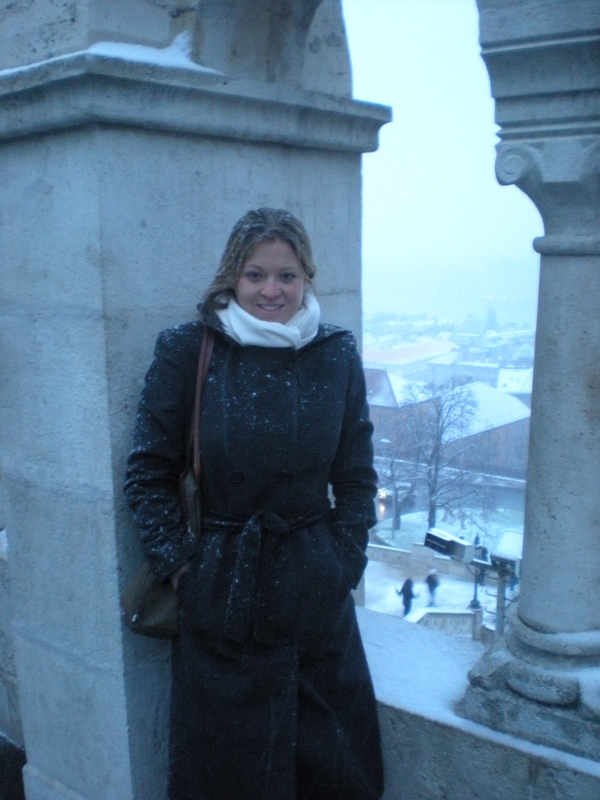 On Sunday, Brandy’s first full day in Budapest, we were caught inside most of the day, surprised by the cold, snowy weather. Usually November comes to Hungary with more clouds than usual, some rain, but the temperature usually hovers around 5C, which if you are a northeastern Ohio native, 40F (especially at 6am) in late November is practically balmy. So we were discouraged when seemingly out of no where, the sky opened up and the snow started to fall Saturday night, just as we were on our way to the airport. But on Sunday morning, I opened the window to the bedroom and took a picture in the early light. 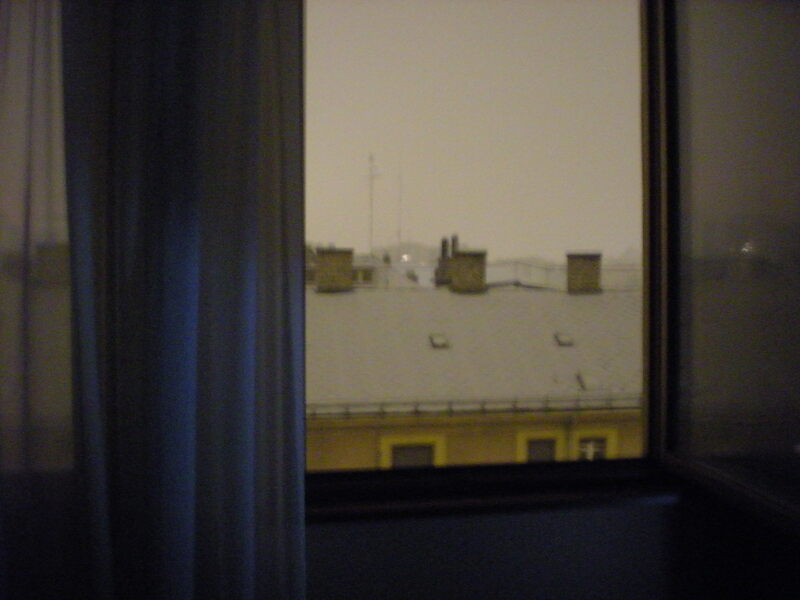 Before I came to Europe, it was always my little fantasy to look out and see rooftops covered in snow. It was really the perfect moment. Undeterred by the poor weather start to the week, we took the bus to the Lánchid bridge, and walked across to meet Györgyi for lunch at Marvelosa, one of our favorite little workweek lunch joints. They always have a lovely daily menu and the atmosphere is cozy and unpretentiously arty. 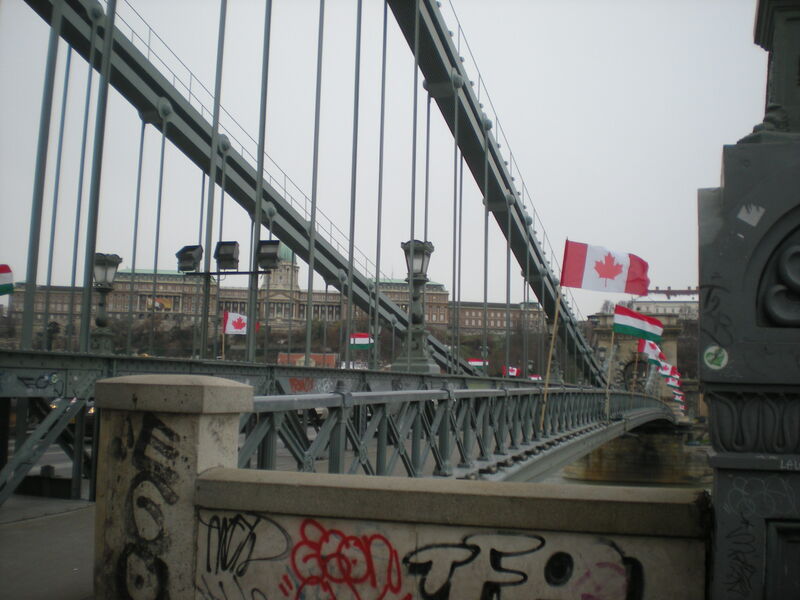 For some reason the bridge was covered in Canadian flags. Now I’ve been here for nearly six months, so these little oddities no longer surprise me. But imagine if you will, the most famous bridge in your country, and then on certain weeks seeing other countries’ flags adorning it. I hope Brandy was able to get some pictures without the flags, though, so that she won’t look back on this trip twenty years from now and think, where was this in Canada? After lunch we took the Sikló, which is like an old incline, up the face of the castle wall. It’s 800 Forints for a 1 way ticket (about 4 dollars), which is harder to justify in the summer if you’re capable of making the long trek up to the castle, but in the Canadian-arctic-like temperatures, we were happy to hitch a ride. It also gave us a really spooky view of the snow coating and fog rising from the Danube. It was almost impossible to see Parliament, which is a common site just across the river. We spent about 45 minutes walking around the castle district, popping into a few shops along the way to get warm. 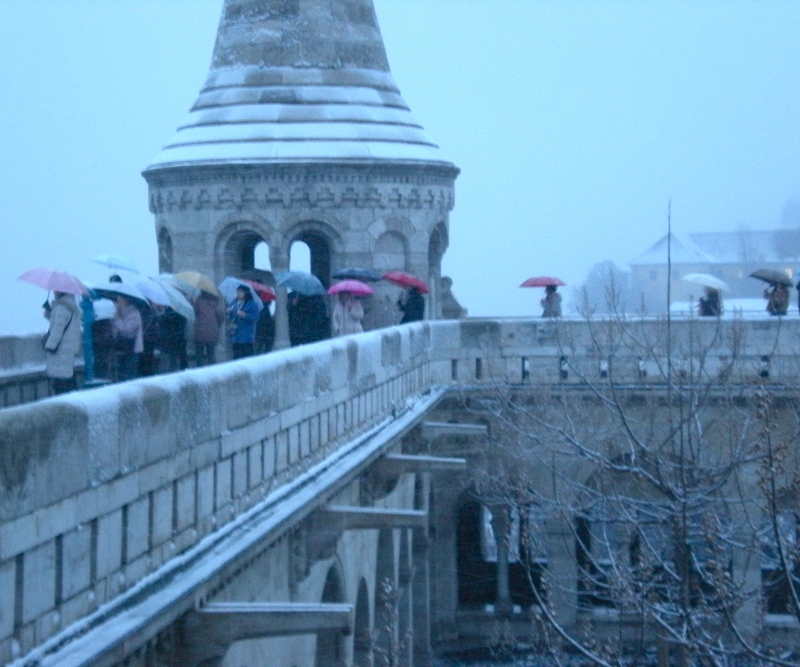 At Fisherman’s Bastion we saw about 20 tourists with umbrellas, a familiar site in any weather. Brandy commented that even though the weather was snowy, the castle seemed really suited for snow cover. And I have to agree. Even with the noisy umbrellas in the background, the district was uncharacteristically quiet. Some children were running and throwing snowballs. A few shop owners were warming hot wine or sweeping the snow off the stoop. So with the power of hindsight vision and the comfort of my warm apartment, I can fully remember it as a lovely wintry evening in Buda. The pictures are gorgeous!! You do such a wonderful job capturing the landscape. It sounds like you had a wonderful Thanksgiving. We will miss you at Christmas…it won’t be the same without you, Mary, Rob, Brian, Tom, Shirley, Erin Jean, Robbie (well you get my point). Thank you so much! The light here– even in the dreariness– is so beautiful and peaceful 🙂 I wish we all could have closer Christmases as well, though I’m a bit of a homebody! I suppose it’s the way of the world– the way that a family experiences the world. And probably we should be happier for it.